Acer may seemingly release a new laptop model every eight seconds, but the majority offer excellent value for money, with strong specs for the asking price. We were therefore disappointed by the performance of the Aspire 5560G, despite its strong graphical abilities. At first glance, this is standard Acer fare. The plastic body looks smart with its dark grey finish, covering the lid and the interior. It isn't exactly a gorgeous machine, but you won't be carrying it around in a brown paper bag either. Build quality is typically strong, with no troublesome flex in any area. Acer's usual isolation-style keyboard is in place, and as comfortable to use as ever. By stretching the full width of the chassis, the board is a great size with spacious keys and even fits in a numeric keypad, which number-crunchers will love. The only irritants are the tiny arrow keys, which have been crushed into a single row. Keys are firmly mounted, giving a solid typing action. Unfortunately, once you delve into the Aspire 5560G's innards, the fairytale ends. 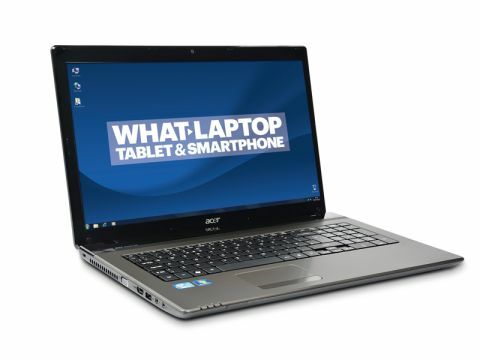 Many of Acer's laptops feature Intel's latest Sandy Bridge processors, which are powerful enough to run all manner of software, even at the same time. However, this device uses a less powerful AMD processor instead, and the results are unsurprising. Compared with other Acer laptops which cost over £200 less, the Aspire 5560G just can't keep up. It runs the latest office applications perfectly, and wirelessly browsing the web is a smooth experience thanks to the 802.11n Wi-Fi support. However, if you try to do too much at once you'll notice the occasional annoying lag. You do get a generous 8GB of memory, which helps when multi-tasking, but it feels wasted on a processor this clunky. The main selling point of this laptop is the graphics card, again provided by AMD. This GPU is actually a combination of integrated and dedicated GPUs, which work together to render images. It's a peculiar arrangement but we had no trouble playing recent games, while photo and video editing software also ran smoothly. The widescreen 15.6-inch display is a reasonably bright screen with sharp contrast and deep blacks, and photos look pleasingly colourful. Be prepared to fork out for some dedicated speakers if you want to enjoy music and movies at home, though, as the built-in pair are underpowered. At least you can store your entire media collection on the 750GB hard drive, without resorting to external storage. If you're looking for a laptop to keep you productive away from home, the Aspire 5560G isn't ideal. The 2.6kg chassis isn't too hefty to lug around, but the mediocre battery life is limiting. We managed around four hours of life if we confined ourselves to basic tasks. You'll be similarly confined to watching short movies; a far from perfect scenario.